We have published two new Rolling Stock Library entries for two old pieces of rolling stock. 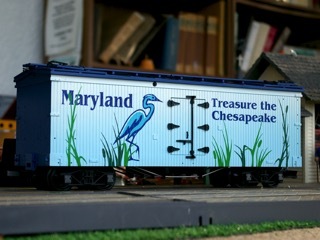 The USA Trains Moosehead Breweries refrigerator car, purchased in January 2009, and the USA Trains Treasure the Chesapeake refrigerator car, purchased long before that, are now properly represented on the site. In addition, as these are the first pieces of USA Trains rolling stock in our library, we have added a section for USA Trains in our manufacturers list. We recently completed a comprehensive downsizing of our layout. With much of our rolling stock now in a dedicated storage area when not in use, we realized devoting a substantial portion of our layout to an empty yard was wasteful. We also wanted to reconfigure the layout to provide more walking space around the layout. Now, the track loops define the layout's boundaries and all buildings are within the loops. The loops themselves are roughly the same size, though the sides are no longer parallel; the station side is now at a slight diagonal. Some switches have been removed, but they were redundant and no functionality has been lost. A small yard—more for show than functionality—now sits where SERR School and the Johnson Dry Goods hardware store once were. Where the yard used to be is now where our town is, consisting of the stations, the hardware store, the Apple Store, a church, a house, and other railroad structures. We have published a revised version of the Rolling Stock Library entry for our LGB Amtrak trainset, including lots of information on the prototype. 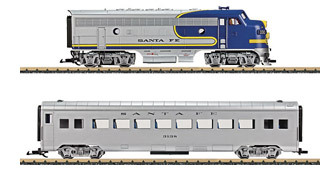 In other news, LGB has announced their new products for 2010. Notable among these is the return of the F7 A- and B-unit locomotives and accompanying streamliner coaches, available in Santa Fe livery. You can download a PDF of the brochure or view details on LGB's website (German). Today we took delivery of the newest piece of rolling stock on the layout, an LGB 40820 Santa Fe center flow hopper. Pushing 20 inches in length, the hopper is reportedly close to 1:29 scale, the same as our relatively new LGB Amtrak rolling stock and as our Aritsocraft pieces. The hopper has opening loading and unloading hatches for each of the three storage compartments. We hope to have a picture- and detail-filled Rolling Stock Library entry for the hopper online soon, along with an entry for our USA Trains Moosehead Ale refrigerator car. In other Rolling Stock Library news, the Stainz entry has a new, better, and bigger picture. Coincidentally, just as we relaunched our website, LGB has relaunched theirs. Rolled out two years after Marklin bought the assets of Ernst Paul Lehmann Patentwerk, the new LGB website replaces what was basically a placeholder website that offered little more than downloads of price lists, availability schedules, and product brochures. The new site closely follows the design of Marklin's own website, with sections for products, service, and online shopping. There is also a product database split into narrow gauge trains, standard gauge trains, and track and accessories. However, the database only covers products available under Marklin's LGB and, as such, is a far cry from the much more complete database that was available on E.P. Lehmann's site. Currently, the website is only available in German. However, it is already partitioned into a German version in the same way Marklin's bilingual website is, so hopefully an English version will be coming soon. Two years to the day after we relaunched E&A Trains, we have refreshed the site's design. While the overall layout, function, and navigation remain the same, the design as a whole is much lighter. The altered layout also provides room for more content even though the site itself has the same width. Because the right-hand column found on most pages has been moved out of the main content area and into its own, we can reclaim previously wasted space for content. The new layout also makes it easier to access subsection pages. For example, the Archive section has subsections for the News Archive, the Rolling Stock Library, and the Building Library. Now, those three subsections are easily accessible from any page in the Archive section. We believe that this updated design will make it easier for E&A Trains to adapt and grow and we will continue to tweak the site as we adjust to our new look. 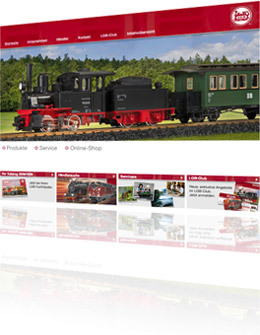 This site is the online home of our G-scale model railroad, with trains made by LGB, Aristocraft, and Bachmann. As you explore the site, you'll find news, pictures, movies, and detailed descriptions of every building and piece of rolling stock.